Since the 1970s Laurence Aberhart has been photographing locations of cultural interest. While Aberhart takes a traditional and controlled approach to photography his work is unconventional, inverting the position photography has held in the past as a truthful eye, using it instead to suggest the unspoken truths of history. His work suggests that ‘place’, be it the natural landscape or the built environment, has an enduring memory and resilience. 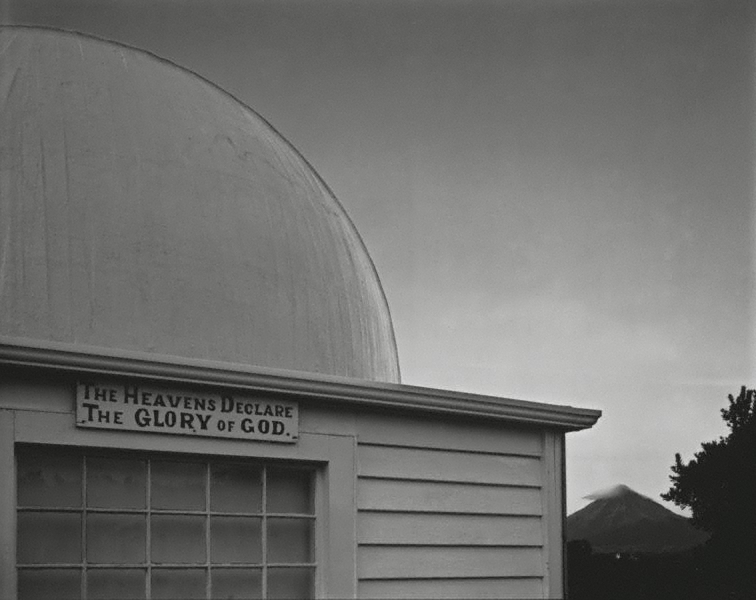 The selected work has a metaphysical aspect in its content: Parihaka is an important location near Mount Taranaki, New Zealand, where a pacifist Maori group lived in the 19th century, their dreams of a gentle, inclusive and egalitarian society destroyed by the government of the day. The ancient and perfectly formed volcano Taranaki and the imposing observatory in the foreground stand as enduring witnesses to the passing of time and human history. Similarly, oceans, stone statues, vacant buildings, faded signs – all have appeared as resilient survivors in Aberhart’s photography. Aberhart’s interest in the historic is evident both in the choice of location and the photographic techniques employed. Using a vintage 8 x 10 inch Korona view camera and contact-print processes the artist revisits 19th-century photographic techniques used to record the landscape. This early photographic technology requires long exposures as it slowly absorbs detail and light and, particular to Aberhart’s interest, evidence of time itself. The resulting images, which combine superior depth of field, rich detail and intense luminosity, have a hallucinatory effect. Signed and dated l.r. corner, silver pen "L. Aberhart 1986/1987".